Raita is a generic name for any salad with a spiced yogurt dressing. In the north of India, the yogurt is flavored with roasted crushed cumin seeds and chili, while southern India excels in making a yogurt dressing with a hot oil seasoning. To add an extra dimension to the taste and texture of the raita, crush 55 g/2 oz roasted salted peanuts. Mix half into the raita and sprinkle the remainder on top just before serving. Peel the cucumber and scoop out the seeds. Cut the flesh into bite-sized pieces and set aside. Put the yogurt in a bowl and beat with a fork until smooth. Add the sugar and salt and mix well. Preheat a small, heavy-based saucepan over a medium-high heat. When the pan is hot, turn off the heat and add the cumin seeds and peppercorns. Stir around for 40-50 seconds, until they release their aroma. Remove from the pan and leave to cool for 5 minutes, then crush in a mortar with a pestle or on a hard surface with a rolling pin. Reserve ¼ teaspoon of this mixture and stir the remainder into the yogurt. Add the cucumber and stir to mix. 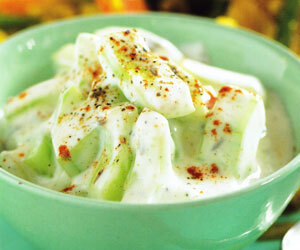 Transfer the raita to a serving dish and sprinkle with the reserved toasted spices and the paprika.